Mahler’s 5th symphony – live! This week and the last I had the great opportunity and challenge to try an entirely new kind of work. Well, not entirely new, but most definitely a new spin on anything I’ve tried my hand at in the past. 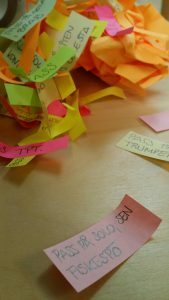 Post-It notes torn from the score to Unsuk Chin’s Clarinet Concerto. Among the more unusual aspects of the concerto was that the percussionists were asked to perform on fishing rods which I, of course, called out for the camera operators to capture! Since 2014 I’ve been writing concert presentations, biographies and the like for Berwaldhallen, the concert hall of the Swedish Radio Symphony Orchestra and Chorus. Earlier this year I also started presenting concerts. 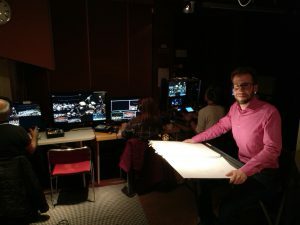 Now, for Berwaldhallen’s first live concert video streaming, I was hired to work with the video team, reading the orchestra score and telling the camera operators what was coming up in the music. The week before, when the orchestra performed Unsuk Chin‘s Clarinet Concerto (with mind-blowing Finnish soloist Kari Kriikku) and Béla Bartók’s ballet The Wooden Prince, we did a trial run. This week, though, we went live with Gustav Mahler’s majestic Symphony no. 5. Preparing for something like this involves listening to the music and studying the score carefully, making note of all the important instrument entries as well as more subtle but interesting touches that you might not immediately notice just by listening. For instance, if the harp plays a subtle but important role we might want to show that. I consider there to be an educational element in this as well, that we can, if only subtly, help people understand and appreciate the music even more if we give them a better look at what is actually going on. Mahler’s fifth symphony is a brilliant musical work. If ever anyone needs to be reminded of the dynamic of symphony orchestra music, of the delicate sweetness as well as the furious, raw power, look no further. It is an intricate and minutely detailed work with plenty more things to make note of than we had time to do in the broadcast. The video above was recorded during the dress rehearsal in the picture control room. A little behind-the-scenes glimpse of what makes a production like this work! The recording will be available to watch for 30 days following the live broadcast on Friday May 5th at www.berwaldhallen.se. Seated in front an orchestral score with the camera operators and the technical director in the background, ready for action.